I am a busy Realtor in the Cowichan Valley. I love to travel, but find it hard to get away, so I'm bringing guests to my property instead! Once you visit the Guesthouse, you will see why I bought this property. It is truly magical, and I want to share where I live with others. Maple Bay is a quaint community approximately 10-15 minutes from downtown Duncan by car. There are several pubs and restaurants near the Guesthouse, and the Maple Bay Marina has a small market with grocery necessities and really good ice cream and local arts & crafts. A bathroom with sleeping loft (double bed), a tv room, and a kitchen with large deck. Three individual cabins for you to enjoy. Cabins are joined and accessed from the exterior via decks and staircases. PLEASE NOTE: Sleeping loft is accessed via a steep narrow staircase, like a ladder. Very unique and very comfortable, but guests must be able to climb stairs. Private hot tub and sauna under a covered deck, and a fire pit with wood to keep you warm on chilly nights! Bathroom has a toilet, shower and sink. We loved our stay here! Gorgeous quiet spot overlooking the ocean and the nearby yacht club. As other people have said, the fact that it’s on 3 levels is not inconvenient at all, we found it quite cute! Kitchen had everything we needed. Renee came down to introduce herself when we first arrived and make sure we had everything we needed and we didn’t see her besides that, which was perfect for us because we love privacy. Perfect, peaceful getaway BBQing, exploring, and watching shows when it was late at night. My husband and I really enjoyed our stay and found it to be so relaxing and quiet. The perfect little getaway for us. We also thoroughly enjoyed Emandare Winery and taking the ferry over to Salt Spring Island. Renee was very friendly and the amenities (ie. hot tub and On Demand movies) were a definite plus for us. We'd love to return some day! Beautiful, private location; quaint set up; very accommodating host. This unique property utilizing 3 separate buildings that are situated one below the other on the ocean cliffside is privately located in the lovely Maple Bay area. 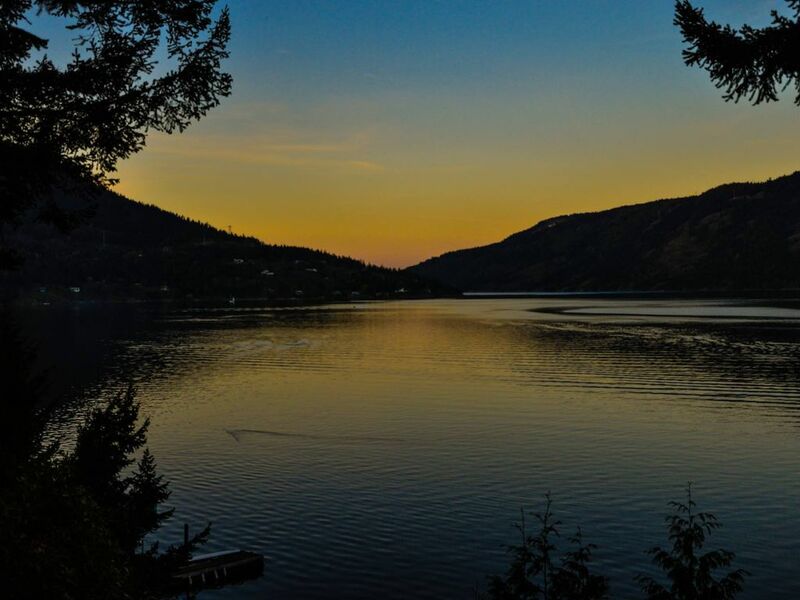 The view from the front deck is typically lovely and serene, we're sure, with the Maple Bay Marina a few lots over. Unfortunately—and at no fault whatsoever of the host—the first morning of our 3 day stay a barge rolled into the marina just in front of where we are staying, and it became evident that they were going to replace some existing pilings at the marina dock. It was actually interesting to watch how they navigated the service barge in and set it up and to watch how they used the large crane to extract the existing old wooden piling. What was unfortunate was the noise over the next few days as they struggled to pound and vibrate the replacement metal piling into place. At times it was very noisy, and took away from the peaceful setting that this little getaway is set in. It also meant that the otters and other wildlife that we caught a glimpse of on our first evening here, prior to the arrival of the barge, were not around due to the noise and activity. Having said that, we recognize that this was simply a random happening that the host had no control over. The host, Renee, messaged us as we were enroute to the rental property to let us know that the hot tub had quit working the previous evening. We were very disappointed to hear this, as it had been one of the draws for renting this particular property, especially considering the cool, rainy weather that was happening. Renee recognized this, and had an electrician out to look at the hot tub before we had even arrived for check in that afternoon! The part had to be ordered in and still they had the hot tub up and running by early afternoon the next day. We so appreciated how proactive Renee was in solving this problem! Awesome place to unwind and get away from it all! We had big plans to explore the area, but ultimately sat on the deck with glass of wine in hand, watching the world go by on a sail boat. Excellent place to kick back, read a book and relax. What a beautiful spot! My wife and I stayed 4 days and we enjoyed it very much. Beautiful and unrestricted view of the water in a very quiet place! Lots of things to do if you love nature. We rented kayaks, visited the farmer's market, hiked nearby trails, went on a day trip to Salt Spring Island... and relaxed a lot. To top it off, Renee (the owner) was very kind and welcoming! Best rental we've had in a long time.